5 design resources you need to get today! Web design is the fundamental cause for either stupendous success or complete failure of your venture. Unfortunately, many of us don’t pay the attention which the look and feel of your website requires. Fortunately, there are resources which can easily make your site look professional with a fantastic user interface. Here are five fabulous design resources which can catapult your website to an iconic status. This is the ultimate resource for all website owners. Remember that the landing page is the most important part of your site and first impressions are the last. This Seven7 landing page PSD has been designed thoughtfully and caters to the best design practices. With a fully responsive (Bootstrap framework) and modern IOS7 Style Design it is sleek and exclusive. It has a wonderful Parallax scrolling effect which is easy on the eye. 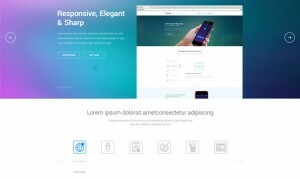 Seven7 Landing Page PSD is not only visually appealing but also caters to all the features which a landing page requires. In addition to Portfolio / Gallery Section, it has About, Team Section, Feature and Pricing Tables. What more can you ask for? With this Seven7 Landing Page PSD your website can be up and about in a jiffy. And no sweat either. Not to forget the Newsletter Signup, Testimonials and Client Sections. Often website owners dig into the net to find appropriate icons for applications. You no longer have to hunt for these elusive icons. Flatstyle Application Icon Set PSD has every conceivable icon which you can think of. These are modern in design and give that professional look to your website, which you a have always yearned for. Here is a fantastic landing page PSD for the fitness folk. Fitness trainers and fitness centers can now concentrate on building bodies of their clients rather than wasting time on building their website. The FitnessTime Landing Page PSD is a perfect fit (body hugging and well-shaped) responsive PSD for those in the business of fitness. The modern design has everything a fitness center would need – Trainers / Gallery Section, Feature and Pricing Tables along with Partners and Contact Form. It’s perhaps the easiest way to get your website in shape. User interface can make or mar your fortunes as well as that of your website. Successful professionals have discovered this secret a long time back. Here is a great tool to create a beautiful and fully interactive page – the Minimal UI Kit PSD. It has everything that a professional website requires – Navigation, Login Form and Social Options, Video Player, Recent Tweet Section, Traffic States, Graph and Progress Bars, Newsletter Signup, Calendar and Simple Mailbox and much much more. Webmail has always been and will remain an important part of a website. Whether you are looking for subscribers for your newsletter or to interact with your customers, Webmail is the only alternative. A well designed webmail can enhance and improve the number of subscribers to your website. 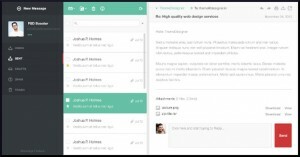 Mini Webmail PSD is a simple little package which is a delight to use and easy to install. Combined, these five design resources are sure to convert your website into a dynamic, interactive and a charming place to be in for your customers and visitors. Grab them here for free!